There’s nothing cuter than 3 year old little girls wearing leotards attempting ballet poses. Aislynn gave ballet a try this week with much enthusiasm. After a full week of talking about going to ballet class, followed by “practicing” for ballet class, the actual day of ballet class finally arrived. Fully decked out in ballet apparel a full 3 hours before class, Aislynn anxiously waited for 2:30PM to arrive (our scheduled departure time). When 2:30PM finally rolled around, she commented, “This is going to be GREAT mom!” On the drive over, I actually started to feel a little nervous, hoping this little 30 min ballet class would meet my little “ballerina-to-be’s” enthusiastic expectations. 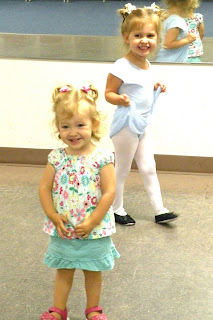 We walked into the tiny ballet studio and met Mrs. H. “HELLO BALLET TEACHER!” Aislynn excitedly proclaimed. I am convinced Aislynn might actually be the most enthusiastic student to greet Mrs H. in her 39+ years teaching ballet. Mrs H. found some tap shoes for a grinning Aislynn to try on while waiting for the other students to arrive. 5 minutes later, 3 little girls decked out in leotards, ballet skirts, and hair bows walked into the room, immediately greeted by the newest and happiest addition to their class. Aislynn was actually entering the ballet classes 2 classes into the session and took it upon herself to make up some lost time with her fellow ballerinas. “Hi girls!” She announced vigorously waving as she approached the small cluster, “It's time for our ballet class! My name is Aislynn Rae Fuller,” then turning to me she asked, “What are all the girl’s names?” Her fellow classmates actually looked a bit surprised. I think they too, had never met such an enthusiastic little girl. I turned to the moms and said, “As you can see, she is very excited to be here.” They all smiled. Finally the moment arrived. The tiny class of tiny ballerinas was under way. They started with a variety of body movements and marching with little tap shoes. Next, ballet shoes, some attempted leaping across the room, ballet bar, tumbling and rolling on a mat, and of course stretching. Mrs. H’s clear expertise showed, as she spent just the right amount of time on ever step to keep the girls attention. It was a jam packed 3o mins. filled with new things, unpredictables, music, concentration, interaction, and of course fun. For me this sweet, simple 30 min ballet class represented a milestone. All the components of this day-the new faces, friends, activities, sounds, unknowns-that made it so joyous for my little life lover, would have sent her into a tailspin 1.5 years ago. Today as I attempted to tidy up and go through boxes on a search for my missing wedding ring (we’ll save that story for another day, hopefully when I am sharing how I found my missing ring), I came across a large blue binder titled, “Aislynn’s therapy notebook.” Flipping through the dense book evoked mixed emotions: Gratefulness and thankfulness realizing where we are at and how far we have come; anxiety and fear, remembering such an unpredictable and difficult time. I remembered weeks filled with 4-5 various therapy sessions a week while caring for a very cranky, fussy baby Isla (see left, Andy working his magic on high maintenance baby Isla). I remembered exhausted, sleepless nights getting up with a newborn, wrestling with a possible autism diagnosis, and dreaming about activities I could do with Aislynn to help with her various delays. I reflected on the chaos of fear, while trying to find peace with what the future might hold. I actually felt my heart rate accelerate as I flipped open the book to the section entitled “evaluations.” I pulled out a report entitled “Initial speech language pathology report, 12/14/07.” At that time my now 3.5 year old socialite and enthusiastic lover of life, was a very different little girl. At the time of this initial speech evaluation, Aislynn was 26 months old (see right, Aislynn 26 months playing in 10lbs of rice = sensory activity time). You can read a condensed version of Aislynn’s developmental journey here. I skimmed the report flipping to the “stats” on the last page and Aislynn’s delays laid out plainly in percentages according to the Rossetti Infant Toddler Language Scale: Pragmatics 35% delay, Gesture 23% delay, play 35% delay, language comprehension 15% delay, language expression 12% delay. This evaluation only dealt with language and socialization. We also had issues in the area of nutrition, feeding, sensory, and occupational therapy. At that point in time-where I am standing right now-was nowhere close to being a reality, only a hope and a dream. Back then, it was in my moments of optimism, hope, faith, belief, and pleading with God that I saw glimpses of playdates instead of solitary play, joyful greetings instead of tantrums and refusing to say hello to others, and conversations laughing and talking instead of scripted and literal speech. 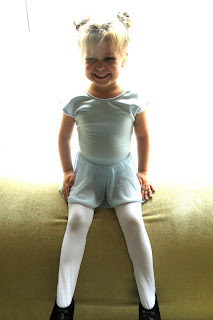 It was in my most hopeful times that I dreamed someday my little girl might go to ballet class with other little girls and laugh, smile, and pose. Answers.com defines hope, “to wish for something with expectation of its fulfillment.” Today I am fulfilled. 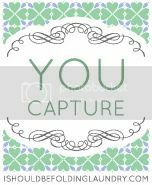 This is the first "YOU CAPTURE" for me. 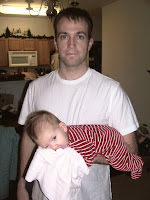 After browsing blogs, I came across "I should be folding laundry" and thought, "How Ironic? I actually SHOULD be folding laundry right now!" I have 2 energetic excited, and emotional little girls. Yea...really looking forward to the teen years with these 2. I love candids. Here's Isla (18months) "talking" to Grandpa, well...listening. He is very animated! 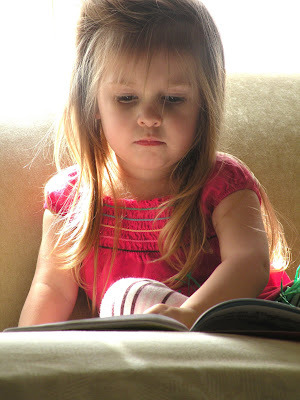 Here's Aislynn, my little reader. 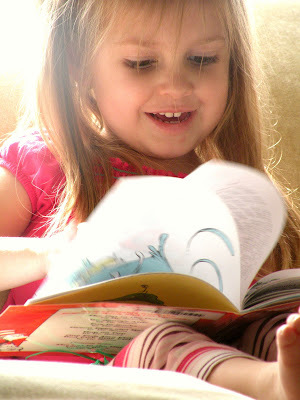 I love taking pictures of her reading and watching her little facial expressions. I prayed that she would call-she did. I wanted a second chance-I got one. 2 months ago I wrote about a very special meeting between strangers. 2 months ago I was in the right place at the right time. Some people might call it fate, or destiny, or a strange coincidence. I don’t believe in any of those things, I believe in purpose. You can look back at the meeting I am referring to in greater detail, but here are a few “Cliff’s notes” for those who are feeling a little lazy. In my second week as a Bloomington resident I met a mom at the children’s museum. The minute I saw her, I thought “she needs one of my baby carriers.” In one hand she held a very young baby, holding her other hand was a 3 year old little girl with very fine hair and an incision scar on the back of her head. This little girl was receiving proton therapy for her brain cancer here in Bloomington. She was 5 hours from home, and calling Bloomington her “home” for the next 2.5 months. The mom noticed a carrier I was wearing and we struck up a conversation, I gave the mom my number and waited. She called, we talked, we played phone tag, time passed, and we talked some more. She was very interested in trying out a particular carrier I make. Before a conversation involving cost and payment arose, I told her something I had wanted to say for weeks as I waited for the right time to say it. I said, “I just want you to know that I am making you a carrier as a gift. I don’t want you to feel weird, but the minute I saw you I felt like it was the right thing to do. I saw you had a little baby and a little girl with a scar on the back of her head, and I imagined that meant you were experiencing something huge. I cannot even begin to imagine all you are going through, but I can make baby carriers, and if I can do this small thing for you that can at least provide you some help and relief and freedom, then it is what I should do. I know we barely know each other, but we are both moms who love our children and we have that in common.” This warrior of a mom thanked me, and we set up a meeting just 3 short days before she would return home to Chicago. I loaded up my special carrier, probably the most significant carrier I have pieced together, along with Miss Congeniality otherwise known as my sweet 3 year old, Aislynn. There was a time she would have won the Miss UN-Congeniality award. I never would have dreamed a year and a half ago when an autism diagnosis was a possibility, that this little girl would become one of the most congenial children I know. If you look at my previous posts about Aislynn you will see what I mean. With great enthusiasm, Aislynn accompanied me to “play with a new friend with fun toys,” in her words. We met at Jill’s House, a place where many families stay while receiving treatment. The little girl and her dad slowly walked down out to greet us. Immediate perspective punched me in the face. I wanted to burst into tears, but realized this family did not need my tears or pity; they needed empathy, listening ears, and a genuine heart. I sucked it up and said a warm hello. As we greeted one another, and walked inside, I followed behind Aislynn, noticing my own little girl’s long hair swaying back and forth with bows on the back of her head, walking next to a sweet little girl, her same age with very fine hair and a large incision scar on the back of her head. Cancer on its own is not acceptable. Cancer in a child is absolutely and completely unacceptable. It was love at first carry. We put baby brother in his new cozy carrier while the girls played their version of go fish, completed synchronized puzzles, and shared chocolate milk. We visited and talked. I listened and tried to encourage, empathize, and get a few smiles and laughs in there. It’s a fine line to walk between genuine care and concern and prying; between not acknowledging the obvious and becoming fixated on the obvious. I have come to believe there is no ultimate right answer for how to interact with someone experiencing something huge. I do know listening, sensitivity and intuition help. For the finale of our little meet up, the girls took turns riding the tricycle down the long dormitory hallway. We said goodbye and planned on meeting the next night for our little friend’s going away party. On the drive home I tried to process what a reality that involved fighting your own child’s cancer would feel like. My heart ached as I imagined that reality. I attempted to wrap my mind around a child enduring a hardship, a battle to live, that most people will never know. I replayed the evening in my mind and felt amazingly peaceful and passionate about my involvement with this family. I felt love, compassion and empathy for this little girl. I felt purpose. We returned for the going away party the next night. We greeted the guest of honor as Aislynn announced, “I’m so happy to see you!” I felt proud and regretful all at once; proud that my little girl showed such genuine joy, regretful that I had not done more. I started thinking, “If only I would have called her more…if only I would have asked them to come over to play sooner…I should have brought them dinner…” I found my thoughts quickly interrupted as a balled up piece of gift wrap landed on my arm. A spunky little boy shyly apologized at the immediate scolding from his mother. I looked at this energetic little boy and noticed the band around his arm. I looked over at his slightly embarrassed mom and noticed the weariness. The regret I was feeling immediately vanished as I felt a new purpose. I started to piece this situation together and asked this new mom flat out, “Are you staying at Jill’s House?” The response was as I expected. We continued our conversation, and I learned the little boy full of life and energy, attempting to break dance, was being treated for brain cancer. She would stay in Bloomington with her son while he received 22 treatments. The rest of her family, were back home in Tennessee. I then learned we were both married, we both had children the exact same age too. She had a little boy the same age as my Isla at home, and the little boy in front of me shared the same birthday week as Aislynn. My purpose was to be a friend to this new mom as I said goodbye to another mom where my purpose had been filled. I am learning about action. Making a difference, being a friend, doing something real and meaningful requires action. When someone is drowning, a good lifeguard doesn’t wait for the person drowning to swim to shore to be saved; the lifeguard dives into the water and carries them out. I by no means am "saving" anyone, I am just trying to be available and aware. As we became better acquainted, I volunteered my digits to my new found friend, which she quickly accepted. The celebration continued full of pizza, presents, bean bag dancing, and swing set time. After Aislynn was thoroughly exhausted (although she would never admit it), we had to say our goodbyes filled with meaningful hugs. I felt an extreme mix of emotions, it was indeed bittersweet. Before we got in our car, the little guest of honor turned to her dad and asked, “Daddy, when we get back to Chicago can we come back and see Aislynn?” He quickly responded, “Of course.” As I shut my car door I immediately said a pleading prayer to God that we would see our little friend again, and that she would enjoy many, many more years of life supported by a family so clearly bursting with love for one another. Once again, I started to process. I felt aware, where I was once unaware. It is impossible to un-see something once you have seen it. For me, I could not un-see this reality that these families faced. Filled with emotion, sadness, fear, passion, questions-I realized my new found friends lived these emotions multiplied times 100 every single day as they fought for the lives of their children. I thought about these moms. As I meet more and more amazing moms, I continue to conclude that mothers are amazing warriors. These moms fought passionately for their children to experience childhood and more. I am not done processing; I am not done gaining perspective. I feel passionate about the days to come with my new friend. Aislynn has already determined that she will play pirates with her new friend when he comes over to our house. I would not be honest if I did not tell you that I am a little scared. I But fear can’t get in the way of purpose. There are so many factors about this situation that make it intriguing to me: The fact that I met two moms each with a child my own daughter’s age, both in need of a true friend. The fact that I on a whim, I took my girls to the museum 2 and a half months ago and met a stranger. The fact that the first mom, led me to the second mom. I could make a very long list of factors that you might find interesting. Some people might call it fate, or destiny, or a strange coincidence. But I don’t believe in any of those things, I believe in purpose.